When it comes to Invisalign, it may seem like everyone is an expert. You may have heard former patients tell stories about how fast treatment time was and how fantastic their results were, but you may hear myths about treatment with Invisalign as well. The important thing to remember about Invisalign is that it works, but you’ve got to put in the work for maximum results. Here are five things about Invisalign that aren’t true. Depending on your issue, your orthodontist will recommend an Invisalign system that will work for you, and may recommend including Invisalign attachments in your plan. Invisalign Teen was introduced for younger patients who want their orthodontic treatment to blend in with their active lifestyles, just like adults! 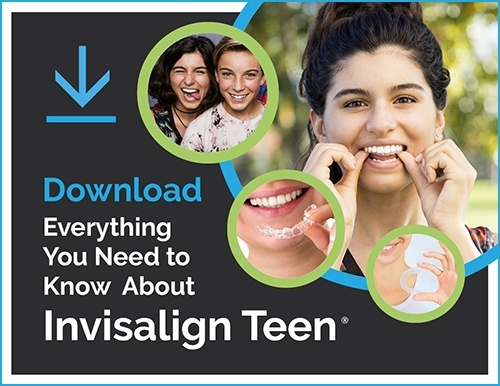 With Invisalign Teen, certain precautions have been put in place, like compliance indicators to ensure the patient is wearing their aligners for the right amount of time each day and extra replacement trays. Let’s face it, teens are busy and sometimes things happen, so being able to have replacement trays available is important. In most cases, the duration of treatment with Invisalign is comparable to braces. Often times, Invisalign treatment can be significantly faster if your issue is minor. Keep in mind that if the aligners are worn properly, patients with Invisalign will see the same results as those with braces in the same or possibly shorter amount of time. Not true! There are levels of expertise with the Invisalign system. For example, Milnor Orthodontics is a Platinum Provider based on the number of cases we’ve treated with Invisalign. That’s why it’s important to do a little research in your area and find an orthodontist who is well-versed in Invisalign. Some orthodontists do not specialize in this form of treatment, and if this is the route you want to go, you’ll want to find one who knows Invisalign. Many patients believe once treatment is over, there’s no need for preventative maintenance. However, after treatment with Invisalign is complete, patients will need to wear a retainer, just like those who have had braces. Even patients who opted for the fastest treatment with Invisalign, Invisalign Express will need a retainer. This is because no matter which form of orthodontic treatment you opt for, your teeth have a very real chance of shifting back to where they started. This is especially crucial for those who had Invisalign Express, since the shorter duration of treatment doesn’t allow the teeth to really settle into their proper positions. Wearing a retainer after any form of orthodontic treatment is required to ensure your teeth remain straight for the rest of your life. There are a lot of myths floating around about Invisalign, but take it from the experts—Invisalign is a proven way to correct a wide variety of issues with the teeth. The key to success is to listen to your orthodontist’s instructions and follow the rules, so you get the most out of your treatment with Invisalign.